It is the second award for DELBROUCK’s KUBI crate in 2016. In January, the trade association pro- K had already awarded this space-saving bottle crate project with the Gold Award . Equally announcing is now that DELBROUCK awarded the Packaging Award 2016 in the category “Economic efficiency”. The jury selected 35 award winners in 10 categories of 213 competitors from 9 different countries. The award ceremony takes place on Tuesday, 27th September 2016 during the trade fair FachPack in Nuremberg. The trade association pro-K presented the Product of the Year 2016 in Gold in the category Storage and Transport Systems to the company DELBROUCK for its bottle crate concept KUBI. The special feature of these crates is that because of their design they can be stacked inside each other when they are turned upside down and whichever way round they are. This reduces the volume of empty crates. The functionality of the KUBI crate has the advantage that when empty crates are transported, 50% more can be stacked on a Euro-pallet. With this award DELBROUCK documents its leading position and expertise in in-mould label technology. Leave the “crate” behind: turn to sophisticated brand packaging. Under this slogan, DELBROUCK GmbH in Menden in conjunction with Alfa Brewery from Limburg (NL) has developed a novel, innovative process for in-mould labelling technology and now introduced it onto the market. 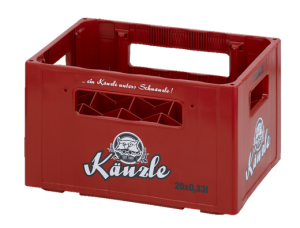 In principle, this involves encircling a beverage crate completely and seamlessly with a high-quality, scratch-resistant in-mould label. A crate was developed especially for this purpose which provides a large radius at the corners to permit the decorative foil (in-mould label) to be curved perfectly. On the basis of the experience gathered with the beverage crate introduced for the mineral spring industry (e.g. Rheinfels) in 2010, DELBROUCK has now created another technical highlight. The investments in the new technology are not inconsiderable; work on the new crate took over one year, and the mechanical systems for high-speed series production were developed further. The new crate’s label design was devised at Alfa, with a significant contribution being made by the owner Mr Meens. At the corners, it features a foaming beer which basically froths around the corner, thus conveying the idea of freshness and liveliness. Overall the look of the crate is extremely high-quality and modern. The effect of the colours is unusually striking in this form and stands out markedly from the competition at the POS. Naturally the new crate satisfies all the relevant requirements for internal and external logistics in the Benelux states. Great effort and care were taken to integrate all aspects relating to washing, filling, sorting and transport (stackability). The new process opens up a wide range of new options for crate design. In the past, only the sides and ends could be used, but now brand names and type descriptions can be written in straight lines or diagonally “round the corner”, just as required. The product and packaging designers can now set to work with totally new approaches to improving the advertising effectiveness of beverage crates. The new process offers enormous potential. One further very important advantage concerns trademarks. The new in-mould label technology enables the crate to be protected as a three-dimensional brand and is therefore an important additional component of brand management. The path from the “boring” crate body to perfect brand design has now been smoothed.